The Brandeis University Division of Science held its annual undergraduate research poster session SciFest VI on August 4, 2016, as a record number of student researchers presented posters with the results of their summer’s (or last year’s) worth of independent research. We had a great audience of grad students, postdocs, faculty, proud parents, and senior administrators. 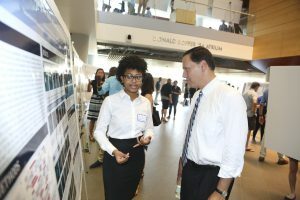 Summer MRSEC Undergraduate Research Fellowships, supported by the Brandeis Materials Research and Engineering Center.